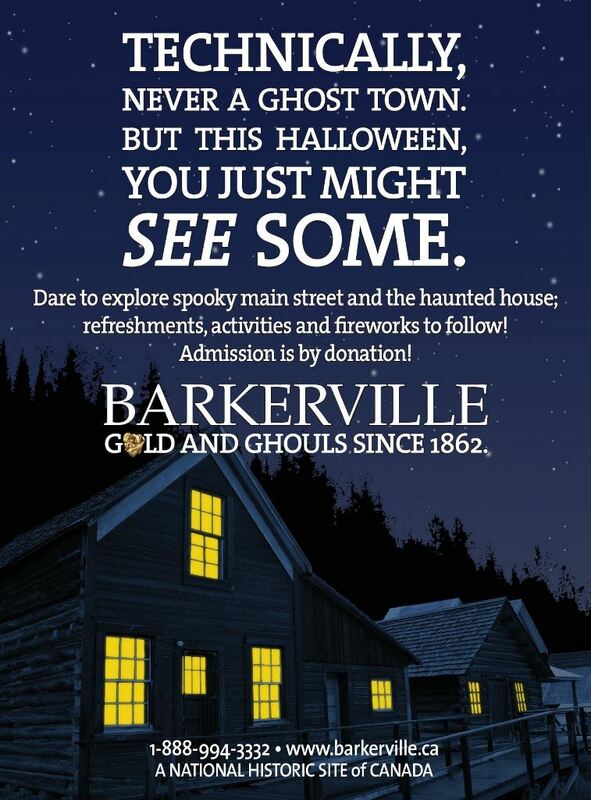 Home » Barkerville » Barkerville is rolling out the “dead carpet” to scare the wits out of visitors on Halloween! Barkerville is rolling out the “dead carpet” to scare the wits out of visitors on Halloween! On October 31st, visitors brave enough to wander through this haunted National Historic site will experience spooky stories and hair-raising tale during a night of frivolity, fright and fun. The self-guided Ghostly town tour begins at 6:30 PM. on Halloween night and participants will explore the shadows of main street after-dark, where monstrous jack-o’-lanterns, traceless spirits, and the secretive pasts of Barkerville’s most notorious residents sometimes lurk. For the bravest of the brave the Blair House of Horror is a must-see experience. Hot dogs, treats and other refreshments will be provided at Visitors Reception Centre, prizes will be awarded for best costumes and a spook-tacular fireworks display will end the evening with a bang!